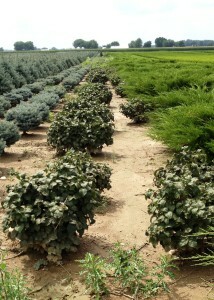 The nursery industry sees many challenges with regards to growing quality trees and shrubs. 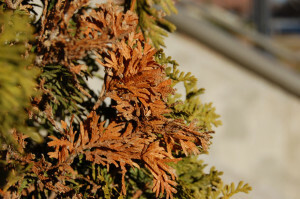 With a true old-school winter this year across the Midwest and having snow cover for over 7 weeks we need to also consider the ramifications of animal browse on Nursery stock. As the snow melts, Listerman and Associates walked a block in a field where rabbits invaded a prime block of Viburnum carlesi ‘Compact’ Fragrant Compact Viburnum (a very nce slow-growing shrub) in which they ate every branch and stem down to the snow level. As a result our 24” Viburnum shrubs now are a chunky 6” plant! The nursery trapped 220 of them before that too! Another favorite of many rodents including rabbits and field mice and voles is the old reliable Euonymus alatus ‘Compacta’ Burning Bush. While invasive species advocates may not be to upset about the girdled and browsed Burning Bush shrubs, but for the grower it will be lost income and time deciding what to do with the damaged plants. Localized browse from the deer population that I have noticed are Taxus species, Thuja occidentalis varieties, Dogwoods, and Viburnum. So not only will the cold be a factor in plant availability but once all the snow has melted will we see all the damaged inflicted under the cover of snow.